Hearing problems, hearing impairment and being deaf can affect many children and adults either temporarily (e.g. fluctuating hearing loss in children) or permanently. Hearing loss in childhood can severely delay speech, language, and literacy development, and most adults will experience a deterioration in their hearing as they get older. Thankfully, hearing aid technology has moved a long way in recent years. Digital hearing aids are now much smaller, are able to pick up less background noise, and tune in more specifically to speech frequencies. Unfortunately, amplification of sound will never replace normal hearing. The development of cochlear implants however, have provided many profoundly deaf children and some adults with a hearing system that allows them to hear speech more clearly as well as develop their own speech skills. Neonatal screening programs are also leading to early detection of hearing loss and allowing parents and professionals to prepare earlier for the deaf child and put appropriate systems in place to facilitate communication and learning. Hearing is a very complex process. When the sound reaches the ear, a complex chain of events will occur before the sound is registered and understood by an individual. Any problems that occur during this process may cause hearing impairment or deafness. Initially, the sound will travel through the air and reach the outer ear (the part you an see on the side of your head, also called the pinna). It will then travel down the auditory canal and causes the tympanic membrane (ear drum) to vibrate. The tympanic membrane vibrates and sends the vibrations along 3 tiny bones (the ossicles) in the middle ear, the malleus, incus and stapes (also called the hammer, anvil and stirrup) to the cochlea. The nerve fibres send the auditory information through several processes in the brain to the auditory cortex where the information is processed and we usually understand or recognise it. This whole process takes less than a second. A problem at any point from the outer ear to auditory cortex can cause a hearing impairment, or a problem with understanding information when it is being processed (auditory processing disorder). The Speech Chain shows how important hearing is in the whole communication process, not only for the listener, but also for the speaker. When we speak we are receiving feedback of what we are saying through our ears. We are able to monitor our volume, articulation and that what we are saying is making sense. At the same time, we are processing this information and our brains are planning what we will say next, and sending these signals to our speech muscles. While this is happening, the listener is hearing our speech, processing it and (hopefully) understanding what we are saying. The inability for hearing impaired people to monitor their own speech is one reason why they may sometimes have difficulties producing clear speech. 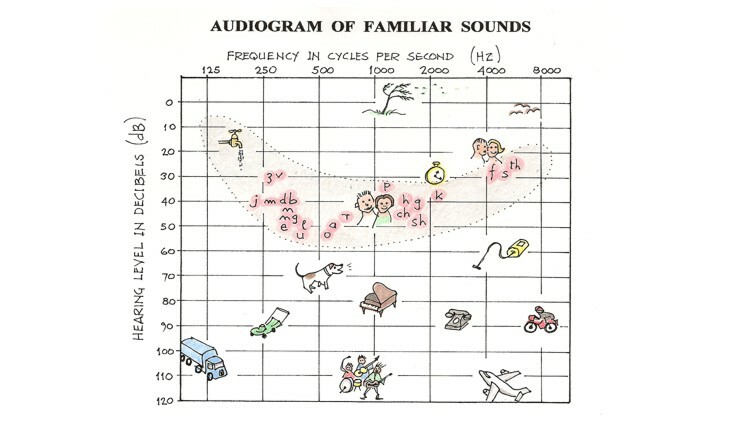 The diagram above represents an audiogram (a graph that shows the results of hearing test) and shows the noise level and frequency of many familiar sounds. As we can see from the diagram, rock bands and jet aeroplanes are very loud, producing sounds at around the 120 decibel level, while a dripping tap and whispering is around the 10-20 decibel level. The shaded area is sometimes called the “Speech Banana”. Normally spoken speech sounds fall within the banana shaped area. Normal speech is spoken at around 30-50 decibel level, with individual sounds varying in frequency. For instance, an “m” sound is much lower in frequency than an “s” sound. This is important to be aware of, because certain forms or degrees of hearing impairment can have a greater or lesser effect on the perception of certain sounds. Hearing is assessed in several ways. Click here to go to our Hearing Tests and Assessment section. 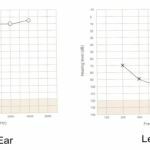 Once hearing impairment has occurred it may be more likely to effect high or low frequency sounds, or both, depending on the nature and extent of the impairment. Hearing impairment can effect the outer and middle ear (conductive loss) or the inner ear (sensori-neural loss). Otitis media or “glue ear”is the most common cause of conductive hearing loss in children and is a general term to describe a number of conditions affecting the middle ear. Infections can cause a lot of pain, the tympanic membrane (ear drum) to rupture, and fever. The inflammation of the middle ear caused by this infection can affect the conduction of sound. Otitis media with effusion is an infection of the middle ear which also causes a collection of fluid in the middle ear space. If this fluid remains for a period it can become thick and glue like (hence the term “glue ear”), hindering the middle ear to effectively carry sound. Sensori-neural loss is a result of damage to the inner ear (cochlear) and/or the auditory pathways that carry sound to the brain. There are a number of factors that are responsible for sensorineural loss including injury, exposure to loud noise, disease, certain ototoxic drugs, meningitis, tumours, stroke and genetic causes. The most common cause of sensori-neural loss is by presbycusis which may be responsible for up to 90% of hearing impairment amongst adults. Presbycusis is an age related hearing loss and describes what happens to most people as they get older. As we age the nerve cells in our cochlear die and get damaged and we see decline in our hearing ability. With children, around 50% of cases of sensori-neural loss will have a genetic cause, and loss may also be caused by birth prematurity, or infection during pregnancy. Sensori-neural loss is most likely to affect our ability to hear higher frequency sounds. Inner ear hearing problems may also include recruitment, which makes the ear more sensitive to louder sounds, so although there is a hearing loss, a sound level slightly above the level of hearing can be painful. If your child has hearing difficulties and is older and able, encourage them to explain to new people that they have difficulties with hearing. This will allow others to compensate for, and understand their difficulties. Avoid important discussions with your child when you are in an environment with lots of environmental background noise, or background noise at home (e.g. the washing machine or the TV is on). Look at the child when you talk to them, often facial expressions and lip movement can give your child lots of cues to tune into certain words. If you are talking to a child with hearing impairment, speak clearly (but not exaggerated) and use your hands to gesture (or sign) and add cues and give meaning. Encourage your child to wear their hearing aid and look after it. It is a complex piece of equipment and needs care and maintenance. When your child first starts using a hearing aid, they may find it a strange sensation and it may take a while to get used to. Encourage them to persist with wearing the aid because they will get used to it and see the benefits. Investigate local support groups and government funding options to find out about hearing impairment support services and funding for aids, services and equipment. Investigate what other equipment is available to help with hearing impairment such as vibrating alarm clocks, enhanced doorbells, services to help with the telephone calls etc. If your child can read use the subtitles option when watching films and television. Most DVDs now come with a subtitles option. At school make sure the teacher is aware of your child’s difficulties and has an understanding of hearing impairment – just because your child has a hearing aid, does not mean they are hearing like other children in the classroom. Students with hearing impairment need modifications to the environment, and teachers need to change their style of teaching to accommodate students with hearing problems. Consider an FM system in the classroom which provides the teacher with a microphone that is linked to the student’s hearing aid. Make sure the teacher is trained in the use of this system and when to use it. There are many strategies and programs to help deaf children. Click here to go to our Communicating with Deaf Children section. Also go to our Hearing Impairment Resources section for downloadable fact-sheets with information and ideas to help your child. Click Here.